Home &gg; Blog &gg; Adobe Analytics &gg; Are Your Employees Wasting Your Marketing Budgets? At this point, I assure them that they are probably not wasting a huge amount of their marketing budget on their own employees, but the reason I ask is that it is very easy to know and make sure that you don’t have an issue. Therefore, in this post, I thought I’d show you a simple way to quantify this. The first step in seeing how much you are spending in advertising on your own employees is to isolate your own internal employee traffic. The good news is that this is something you should already be doing today. If you aren’t, you should start doing this right away. The easiest way to exclude employee traffic is to identify the corporate IP address ranges that your company uses. While this is not perfect, it should be close enough. Even if you have remote employees, hopefully they are using a secure VPN which will route their traffic through your corporate IP ranges (one hint for Adobe SiteCatalyst customers is that if you have IP ranges that change frequently I would suggest implementing a DB VISTA rule that has all of your IP address ranges since that will allow you to add/remove them as needed). Once you know these IP ranges, you can either move that traffic to a different data set (i.e. report suite for Adobe SiteCatalyst customers) or tag them as “employees” in a web analytics variable and build a segment to isolate this traffic. Regardless of how you do this, the ultimate goal is to have a data set or segment that you are pretty sure represents your employees. 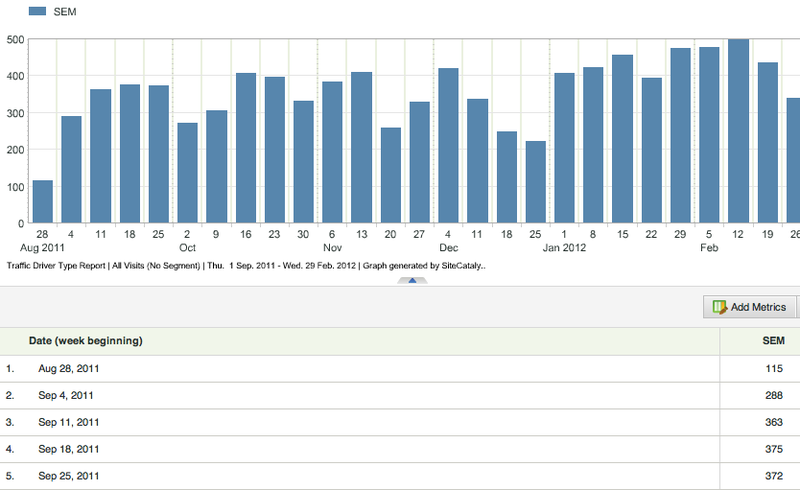 As we can see here, we’re getting a few hundred visits each week. Next we can compute an average cost for Paid Search advertising and get a rough estimate of how much money we are spending on employees for Paid Search. In this example, for the week of September 25th, we had 372 visits from Paid Search and if our average cost per ad was $3.50, our estimated cost would be $1,302 which annualized would be around $65,000. Depending upon the size of your advertising budgets, that could be good or bad. But let’s say that you work for American Express and have over 60,000 employees. It could be the case that you have 20,000 paid search visits from employees in a given month. If the average cost of paid search keywords were $.50, you could be spending $120,000 of your marketing budget on employees! That could get you a few extra web analysts on your team! Also keep in mind that the same principle applies to display advertising and other marketing channels that cost you money. Finally, if you need to isolate the specific advertisements that are being used, you can do this by looking at the detailed tracking codes in your campaigns report. I have found that it is normally the branded advertisements that are the top culprits. Hopefully, after doing this quick analysis, you’ll find out that you don’t have any major issues. But if you do find that your employees are being a bit lazy and eating up large portions of your marketing dollars, there are some simple ways to rectify this. I have found that at large companies, most of the time, employees aren’t aware that they are actually costing their employer money. While people like us live and breathe online marketing, your employees may have no concept of how online advertising works. By using the data you create in your analysis, you can spread the word through company newsletters or intranets and educate the company no how much money is being wasted and ask employees to use free tools like SEO links if they need to get to the website. Besides saving your company a little bit (or a lot!) of money, this is a fun way to show executives at your company the power of web analytics. If the amount of money you save by doing this analysis is significant, feel free to use the data to get you some additional headcount or tools that you have been longing for! A very useful post – thanks Adam. This is easy to do in GA by creating a new profile, it’s just a shame that you need to pay for a Vista rule to do similar in Omniture. It would be great to have a few simple out-of-the-box (and free) reports for my IP filtered traffic, and to be able to add greater than 5 IP ranges via the admin interface.